On August 1, 2016, we will be celebrating our first year of having performances on the Markay stage. To commemorate this milestone, we are celebrating by launching the #I_heART_MARKAY Challenge. You may have seen some of the millions of videos on social media and TV: around the world, people were dumping a bucket (or buckets) of ice water over their heads and pledging support (both through the challenge itself and financially) to the ALS cause. We are not asking you to do that. We are asking you to show your support to the arts. We describe the arts as a physical manifestation of the internal creative impulse. Major constituents of the arts include literature – including poetry , novels and short stories, and epics; performing arts – among them music, dance, and theatre; culinary arts, such as baking, chocolatiering, and winemaking; media arts, like photography and cinematography, and visual arts – including drawing painting, ceramics, and sculpting. Some art forms combine a visual element with performance (e.g. film) and the written word (e.g. comics). At the heart of every challenge is the true cause: raising awareness and financial support to help the Southern Hills Arts Council to enhance the quality of life in the region by encouraging and stimulating the practice and appreciation of the Arts, through the Markay. The success of the Markay Cultural Arts Center depends on the support of the community. Step 1: Decide to take the challenge. In theory, you need to be nominated by another person via social media, but if you want to take the challenge, or (more importantly) want to donate to the cause, just go for it. Step 2: Accept the challenge. One important component of the challenge is that you have to share a video or photo of yourself taking part in the arts and that you must respond to the call to action within 48 hours of being challenged. If you miss the mark in timing, don’t let it deter you from participating and donating anyway! Take the alternative. Donate $10 by stopping by the Markay or by visiting https://markaytickets.org/TheatreManager/1/login&donation=2 . Donations are a great idea, regardless of whether you complete the challenge or not. By taking the challenge, you can still donate money to the cause, but can choose any denomination (donate as much as you can afford). Step 3: State just the facts. You are not doing this to accept an Academy Award or to show your musical prowess. If you are creating a video, this is about a cause, so keep it short and sweet. State your name, and the name of the person who challenged you and accept the challenge. 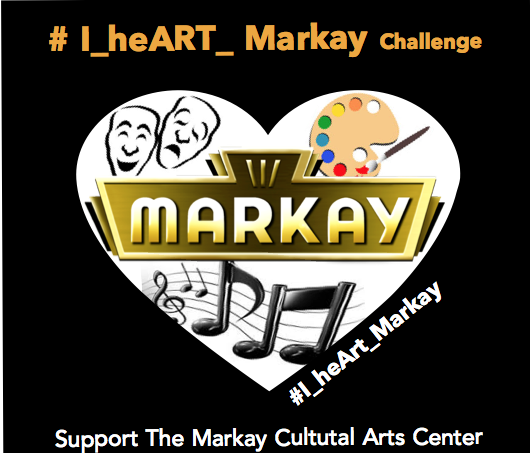 You can keep it simple by saying, “I accept the #I_heART_MARKAY Challenge,” or you can reflect more on the impact that the arts or the Markay has had on people in your life or in our community. Try to keep it short and on-point, though. If creating a video is not your cup of tea, you can post a picture of yourself with a work of your ART. On Video: Challenge three more people (state their names) and say they have 48 hours to complete the challenge. Say that you are donating money (in addition to sharing your ART). (and really do it). On your photo post: Challenge three more people (tag your friends) and say they have 48 hours to complete the challenge. Post that you are donating money (in addition to sharing your ART). (and really do it). Upload video or picture onto social media. We suggest using Facebook, Instagram, and Twitter. —Use hashtags. The point of a viral campaign is to spread awareness, so even if you’re averse to using hashtags, this is a good time to make an exception. Mark your post with #I_heART_MARKAY Challenge, #markaychallenge, and #markay1year to spread the word. —Tag the people you want to challenge. To tag someone on Twitter, put the “@” symbol before their username. For example, if someone’s Twitter name is MovieBuff123, you would include @MovieBuff123 in your Twitter status. — On Facebook, hit the spacebar and type in the “@” symbol. If you don’t leave a space before the symbol, the process won’t work. Type in the name of the person you want to tag. Once you start typing the person’s name, a list of your friends will appear, and you can select the person from the list. — Provide the donation link. The #I_heART_MARKAY Challenge is about awareness and gathering donations, so provide a donation link right there in your post, as well as tagging your challenged friends to encourage their participation, too. Donate! The original point of the challenge was to get people to either do the challenge or donate. However, if you can pledge financial support, it’s a good idea to do both. Many people out there are now doing the challenge and donation, instead of picking one, and every contribution goes a long way.